“But the film is finished, why do you need to raise money?” I hear you cry. In a perfect world we could finish Of Shark and Man, all the right people would instantly hear about it and would approach us to acquire the film for TV broadcast. Unfortunately it’s not that easy, far from it! Releasing a film to the public is all about awareness, the more people talking about your film, means more interest, which in turn, means even more people talking about it and this then leads to mainstream press interest. If the mainstream media are talking up your film, the chances of you selling it to a broadcaster increase immeasurably. The key focus for Of Shark and Man is to get a positive, inspiring message out to as many people as possible, a message that can make them think differently not just about sharks, but perhaps, themselves and also, entertain them along the way. We can’t rely on Facebook and word of mouth alone, we need to get this film out there, we need to get people watching it, talking about it and we need to get in front of decision makers who can put this film on your TV screen for you and your family and friends to enjoy but that costs money. From day one, the resources for this film have been incredibly limited, yet, we know we have far exceeded those limitations. Five years ago, I was told by everyone that it was a waste of time, I’d never get the film made, it was too ambitious and nobody would back a first time, completely unknown film-maker, yet here we are, only a matter of days away from the official UK première to a full house in one of London’s coolest screening rooms! Long story short, anything is possible when you set your mind to it! TV distribution is so important because that will give us the platform to make more of these films and keep getting these inspiring true life stories out to a discerning audience. “Of Shark and Man” has always been intended to be a series of films, with this first film being the series opener and a springboard for continuing to produce daring, high quality, ambitious and entertaining shark films, not just for fans of sharks, but for everyone. Of course, if we raise our goal we will benefit in that it will help us enormously in fulfilling the film’s ambitions but with that in mind, we wanted to ensure we give you the best possible reasons to contribute to our campaign and as such, we have lined up some truly amazing perks and raffle prizes. We’ve been inundated with the same question from all over the world since the trailer came out, “how do I get to see the film?” and this is the answer you’ve been waiting for, contributions starting at the minimum level of £20 and upwards make you eligible to view an online, HD stream of the film in full, without having to leave your sofa! 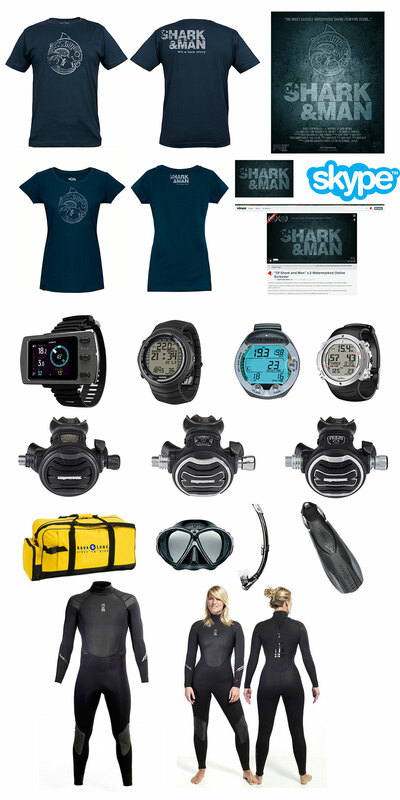 We are also giving away perks in the form of film related merchandise like custom artwork, signed posters, stickers and the official Of Shark and Man T-Shirts (designed and manufactured by Fourth Element no less) and for all you divers out there, top of the range dive gear (men’s and women’s) including computers, wetsuits, regulators, masks/fins/snorkel sets and dive bags from Fourth Element, Suunto, Apeks and Aqualung! If you need new dive gear, instead of going to retailers, come to us, support the film and get loads of cool stuff on top! All the money we raise will go into marketing, film festival submissions, foreign subtitles, promotion, legal documentation, screenings, promotional events and everything else we need to do to get the film out there. We want you to be a part of this journey with us and to be able to see the film and take something from its message. Your help will be massive in getting this film the audience it deserves and we have loads of cool stuff here waiting for a home and we want you to have it!! Please contribute if you can and if you can’t, which we totally understand, you can help by sharing the campaign as widely as possible and giving your friends and family an opportunity to get involved and get loads of awesome stuff! The campaign runs for forty five days, after which Indiegogo sends the funds raised minus their cut (which takes about two weeks) and when they clear, we send out all your stuff, it’s that easy! Also, for everyone who contributed to the very first campaign which was quite a while ago now, you will be getting the updated and improved perks sent out to you as well so if you donated to that one already, your goodies are finally going to be on their way to you in the first shipment of these perks too! One of those perks has already been delivered however, your names are already in the credits for the film and will be added to the supporters page of the website when it’s up and running. So that’s it, this is the final obstacle, let’s get over it together so click here and go check out the Crowd Funding Of Shark and Man.